The Malnutrition Miracle: What Is Ready-To-Use Therapeutic Food? The specially formulated peanut paste known as RUTF is nothing short of a miracle for severely malnourished kids. “I had reached a point where I thought my child was going to die,” says Francess, a mother from Sierra Leone, who came to that conclusion in early 2015 as her two-month-old daughter Naomi Sam grew weaker by the day. They had survived the Ebola epidemic. But Francess, like many parents in the nation's most out-of-the-way places, now stared down another killer — only this time it had come for her daughter. I thought my child was going to die. The new threat was acute malnutrition. Even before Ebola hit Sierra Leone, nearly 13 percent of Sierra Leone's children under five were malnourished. After the outbreak decimated the nation's health system and sparked an economic downturn, those numbers grew even higher. 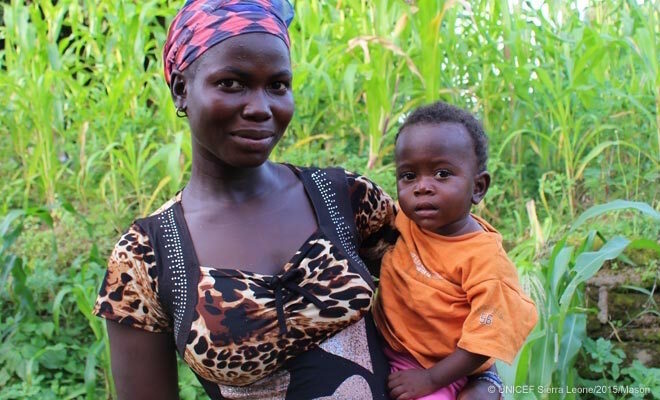 But thanks to a UNICEF program to reach vulnerable children, a community health worker came to Francess' village, diagnosed Naomi's acute malnutrition and transferred her to an area hospital just in time. There, she was treated with Ready-to-Use Therapeutic Food (RUTF) and, after only a few weeks, began to make a miraculous recovery. I wondered what magic made her recover so soon. “I was so surprised about the improvement in her look after she started eating those packets," recalls Francess. “I used to wonder what magic was in the treatment that made her recover so soon." “I thought my child was going to die,” says Francess, of 1-year-old Naomi. Francess thinks that she could have lost Naomi 8 months before if a community health worker had not diagnosed her baby's malnutrition. It's no wonder that RUTF is often referred to as a miracle food. A tasty, energy-packed paste made from peanuts, oil, sugar, milk powder and vitamin and mineral supplements, it is UNICEF's most effective tool for treating acute and severe acute malnutrition (SAM), which, every year, threatens an estimated 16 million children worldwide and claims the lives of approximately 1 million more. RUTF is easy to ship and administer. RUTF is easy to ship and administer. It doesn't require refrigeration and stays fresh for up to two years. Best of all, no mixing with potentially contaminated water is required. Each 100-gram single-serving packet comes ready-to-eat. All parents have to do is what comes naturally: Open the packet, feed their children and watch them grow healthy and strong. The global leader in RUTF procurement, with UNICEF purchasing eighty percent of the world's supply, UNICEF works with manufacturers to increase supplies of the product and keep prices down. Nevertheless, in 2014, lack of funding was a significant reason why UNICEF and partners could only provide 19 percent of children with SAM the RUTF they needed. RUTF lets children grow healthy and strong. Enter: UNICEF Kid Power, a kids-helping-kids movement, which has been narrowing the funding gap and increasing UNICEF’s reach since it launched in October 2014. Kids earn points while getting active with their Kid Power Bands, which unlock funding to get RUTF to the children throughout Sub-Saharan Africa and South Asia who need it. Ten-month-old Younas is just one. 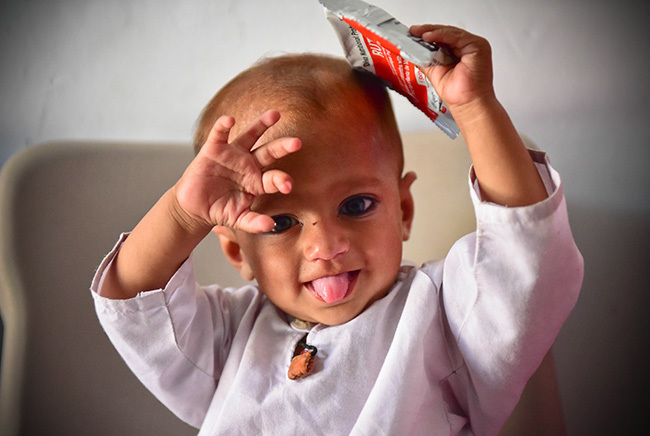 This past spring, his mother Hasten brought him to a UNICEF-supported clinic in South Punjab, Pakistan. The 10-month-old was weak and losing weight each day, and instead of learning to crawl and take his first steps, he mostly cried and slept. "I breastfeed him and give him buffalo milk, but he keeps getting diarrhea," Hasten recalls telling the health workers. Their diagnosis was quick and effective. Younas was suffering from SAM, a major issue for both children and their mothers in rural Pakistan. But after just two weeks on a diet of therapeutic food — RUTF procured through UNICEF Kid Power — he began to recover. And thanks to the health and nutrition training his mother received at the clinic, she now knows what he needs to continue growing healthy and strong. Interactive Kid Power missions teach kids about RUTF. Simultaneously, members of the UNICEF Kid Power Team now know more than they ever did before about the issues facing other children. Each UNICEF Kid Power Band comes with a downloadable interactive “mission” to teach kids about the countries receiving the RUTF packets. To date, 192,000 UNICEF Kid Power Team Members have unlocked 5.2 million packets of RUTF, proving that giving kids the chance to make a positive social impact in the wider world is good for everyone. Support UNICEF's efforts to save and protect the world's most vulnerable children.